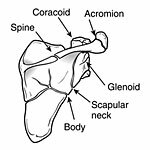 Triangular, mobile, and protected by a complex system of surrounding muscles, the shoulder blade (scapula) is rarely broken. Scapula fractures represent less than 1% of all broken bones. High-energy, blunt trauma, such as that experienced in a motorcycle or motor vehicle collision or falling from significant height, can fracture the scapula and cause other major injuries, including broken ribs or damage to the head, lungs, or spinal cord. > Extreme pain when you move the arm. > Swelling around the back of the shoulder. To determine appropriate treatment, your doctor will probably need to take X-rays (radiographs) of your shoulder and chest to describe and classify the location(s) of fracture to the scapula. In some instances, your doctor may also need to use other diagnostic imaging tools such as computed tomography (CT). Your doctor will evaluate the position and posture of the shoulder and treat any soft-tissue damage (abrasions, open wounds, and muscular trauma). Your doctor may want a detailed neurovascular examination, which may not be possible if you have other severe injuries. Nonsurgical treatment with a simple sling works for most fractures of the scapula. The immobilization device holds your shoulder in place while the bone heals. Your doctor may want you to start early range-of-motion exercises within the first week after the injury. Other fractures may need 2 to 4 weeks of immobilization. Your shoulder may feel stiff when the doctor removes the sling. Begin limited active use of your shoulder immediately. Passive stretching exercises should be continued until complete shoulder motion returns. This may take 6 months to 1 year. > Fractures of the glenoid articular surface in which bone has moved out of place (displaced) significantly. > Fractures of the neck of the scapula with severe angular deformity. > Fractures of the acromion process with impingement syndrome. In these instances, you may need surgery in which the doctor uses plates and screws to hold the bone together.